There are many things that Leonardo DiCaprio does well - star in movies directed by Martin Scorsese; wear a suit; protect endangered species; date models - but according to George Clooney, basketball is just not one of them. It seems the 52-year-old star indulged the younger actor in a game of hoops not too long ago, and in the end, as he tells Esquire magazine in its December issue, he arrived at two conclusions: one, DiCaprio's team talks a lot of trash; and two, they can't back it up. The story goes that the two A-listers are both basketball fans with homes down in Cabo - as one would have, naturally - and after running into each other there thought they should get around to hitting the court. DiCaprio, Clooney says, agreed to a game, but assured him that his team is "pretty serious." To which Clooney responded, "you know, I can play. I’m not great, by any means, but I played high school basketball, and I know I can play. I also know that you don’t talk s*** unless you can play. And the thing about playing Leo (DiCaprio) is you have all these guys talking s***." Clooney didn't specify how long ago this game occurred, but it couldn't have been too far in the past - he's now 52, and he tells the magazine that he and his teammates were around 50 at the time. Even with their advanced age - DiCaprio is 13 years Clooney's junior - Clooney claims his team still beat the pants off DiCaprio's boys. With details like that, it's not really a surprise that Clooney hasn't taken to Twitter (can you imagine his subtweets?). As the "Monuments Men" director and star explains, he just doesn't feel comfortable with the potential for 140 characters to completely undo his career. “If you’re famous, I don’t—for the life of me—I don’t understand why any famous person would ever be on Twitter," Clooney says. "So one drunken night, you come home and you’ve had two too many drinks and you’re watching TV and somebody pisses you off, and you go ‘Ehhhhh’ and fight back. And you go to sleep, and you wake up in the morning and your career is over. Or you’re an a***ole. Or all the things you might think in the quiet of your drunken evening are suddenly blasted around the entire world before you wake up." Like, for example, how much better he is at basketball than Leonardo DiCaprio. Just think... this rant started after Leonardo DiCaprio schooled him in basketball. Why doesn't he just talk about something else like his new move role. Wasn't not to long ago he made comments about his Russell Crowe spat, why does he need to talk about other Hollywood A listers. I really don't care who plays better basketball or what they do with their lives they live, eat, and s**t like everyone else. I appreciate the movies that they make though but that doesn't mean I want to hear everyone's business. All I need to know is what your movie is about and when it comes out, then I'll decide to see it or not. George, I can't understand why ANYONE is on twitter, especially adults. it's such a stupid and juvenile medium for whiners and wanna be fame mongers! More proof that straight men are just a**holes 24/7/365. It's part of your "lifestyle." And kind of a gay comment, too. Gay as in stupid. Everyone knows that straight men have no 'lifestyles.' Just like how we don't wear 'outfits,' or 'hairstyles' because that stuff is for the women. And the gays. Sure, some of us are a**holes, but as you've proven with your statement, Art, so are some of you gay men. Just like all right wing extremists. Fingers crossed that the idiot, has been rocker has a hunting accident soon. People with dementia shouldn't play with guns. Actually, that's very unlikely, seeing as I have years of experience with using all kinds of weapons safely and responsibly. It's more likely that you, with your hatred of guns and common sense, will be a victim of a home invasion or street mugging from one of your inner city homeys, and will be unable to defend yourself because you are a pu$$y. Clooney has not done anything worth a damn since his role on Facts of Life. You let my youngin be. How dare you spat such nonsense. He is a good boy. He is pretty hot, and I'm not even gay. How about Leo let George win because George was older? I remember the swimming pool scene in The Year Of Living Dangerously, Mel let the old guy win the challenge. And, George has to brag to the press. Lol. George is the hottest man I have ever seen in my life and he is aging very well. I feel he is funny, witty and has a good sense of humor. You need to bat your eyes whether you are doing him or not, otherwise they will dry out. Eyes need lubrication, so blink often to ensure that. Sorry, I am mildly retarded and didn't realize I was typing this nonsense. Just call me Cliff Clavin. Clooney is a lousy actor – so arrogant and thinks he it. Crowe and Dicaprio are better actors – better looking too. I disagree. I have found him to be a fine actor and have enjoyed him in practically every movie I have seen him in. Except for that crappy Batman and Robin stinker, of course. Always cool to see a guy like Clooney (respected filmmaker/activist) being REAL about Hollywood and its peeps, especially when giving it straight to the most d*ckish of celebrities like Leo DiCaprio. Go on with your 50-something self, George! I'd rather play a game with you than DiCaprio any day. Hey everyone get a grip this was meant for funny entertainment. There was no political spin, no real fight between Clooney or Leo. It was in good fun. ummmm??....... why you baggin on leo for his basketball skills. im sure u cant do any better! Uh, did you not read the artcile? He whooped him handedly. And yeah, it's not important news but I found it amusing. He obviously doesn't hate leo, he's just joking around as most guys do with their buddies. Twitter has been the undoing of many otherwise good people. It gives you the ability to run off at the mouth on a world stage. Go ahead, put your business out there for all the world to see. I don't know, joking or not, it seems weird to just publicly humiliate another A-lister regardless of who or what kind of friends he is surrounded by. It's one thing to say that you ran into DiCaprio and you guys played and you won, it's another to describe the pregame, the blowout scores, and then to add insult to injury, talk about the kinds of friends DiCaprio had on his own team. It really sounds more like that Clooney has a disdain for DiCaprio. Something happened or was said that Clooney wanted to publicly embarass him. Of all things to be concerned with "tweeting", you'd think Clooney would do more research into the farce of "global warming" before he spouts off nonesense there as he has of lately. Global warming is a farce? Another rightie who does not believe in science. Tell those poor people in the Philippines all about that global warming farce. You ppl are total idiots. Infidels, with all their science mumbo jumbo. If you trolls and naysayers don't pipe down and start towing the line, I'm gonna un-invent the internet! I'm serial! Hey Al, let's go bow hunting. You just need to wear this deer suit. As long as you wear your horse's azz suit. I might add, you wear it well. Looks better than the drag queen suit you are wearing. Why is your lipstick smeared so bad? Is that mayonnaise dripping down your chin? Fluff article. Both these guys are sweethearts. I'm sure his tongue was planted deeply in his cheek while discussing Hollywood Hoops. Wouldn't mind having several beers with either or both of them anytime. George? Leo? Call me! G Clooney is nice and sarcastic; he must be a blast to sit across from at a lunch table. It's nice to see someone in Hollowood has a quick wit. I'd like to squirt a thick stream of trouser chili upon both of their faces. I hear George I'm 52 as well and sometimes I play guys years younger than me. I don't win all the time but when I do its because they can't play better than me and or they are out of comdidation. And if I do lose they know that they were in a fight. Hey George stay away from teenager those kids can run forever. I played with a group of them a week ago and I'm still tried. What if I may George is saying IF U CAN'T WALK THE WALK. DON'T TALK THE TALK! When was this artical about politics? Oh yeah never. Normal life is stressful enough to let a little meaningless, sarcastic, and funny artical go to waste over stupid commentors. I laughed when I read this, be it internally, it's like west side story meets basketball diaries meets cribs. Ironic and hilarious. Why, why, why, do you Republicants have to bring politics into an entertainment blog all the time? Your constant whining is getting pretty old. Tell that to palintwit and the name-stealing liberal clown that's always here. Since that conservatard tool has pretty much lost ownership of those monikers. You should use a name that's a little more suited to your political leanings, like SoKKKman. Or, since you so cleverly reversed it to namkoS, try namKKKoS. And the no-name liberal pu $$ y that lurks here all day rears its ugly head again. I bet you're behind all the name stealing, and probably responsible for the dating spam too. Yes, genius. I have a vast network of name stealing blogger minions desperately combing the marquee blog in search of bloggers with who we disagree. We are legion and cannot be stopped. Paranoid much? I think we all know the answer to that. And no, I have nothing to do with the dating site spammer. Or the other hacker trolls. I'll beat both Clooney and Di Caprio 20-0. Agreed! Loved this real story from a solid filmmaker putting dicaprio in his place. Can't be any worse than some retarded conservative agenda! Yep, he's using a satellite to keep tabs on Sudan to help prevent the massacre and villages of innocent civilians. Totally retarded, right? I have always thought that Leo bears a strong resemblance to David Gilmour of pink Floyd. Man Clooney is such a cool guy. go leo. f*** everyone else. Leo,see if you can run the tables with Cyrus Miley as well as Coaches Roy and KKK do. You learned English as a 2nd language and still struggle with it daily. Either that or you flunked out of pre-school. ...and this is newsworthy? why? and you read it because? You guys are missing the entire point of his story. He's saying that people should know what their skill level is before they start boasting. He is chiding Leo DiCaprio for basically just believing his own hype or believing the apparent sycophants who hang around him. I don't think this is a bad message at all. 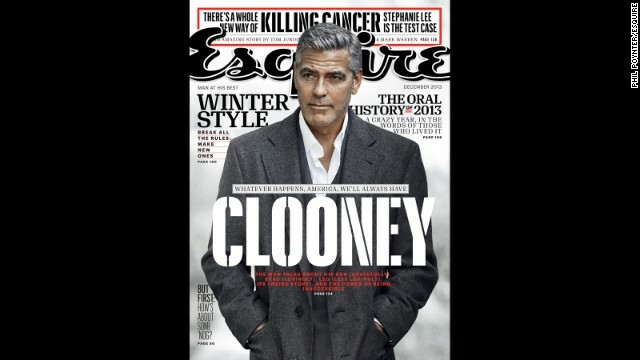 I have to say, I think Clooney is a pretty straight shooter and he doesn't buy into just anything. Strange how CNN reports this story only focuses on Leo, if I recall there was also a story on Russell Crowe. Nevertheless, Clooney is just being a jack a** always so opionated about his other co-stars. Not a classy thing to do. I don't care if they can play ball or not, they are still both liberal idiots. Rose, I wouldn't expect more from a conservative hag like you. People like you are afraid of everything. Rose is a pudgy, balding, middle aged man trying to be clever using a Shakespearean blog name, just FYI. Still a loser conservative, either way. Lol, good story. Age is just a # & I guess DiCaprio found that out. Good for you GC!